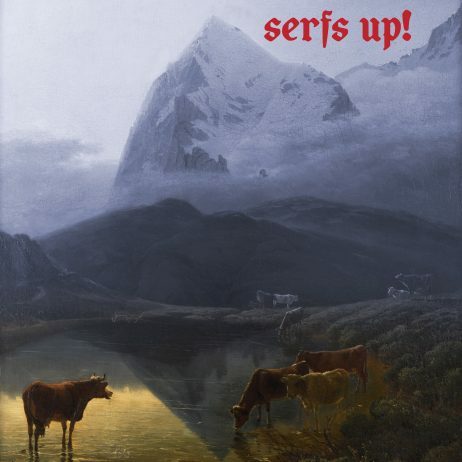 Serfs Up! is a lush and masterful work, lascivious and personal. Tropical, sympathetic and monumental. It invites the listener in rather than repel them through wilful abrasion. Fat White Family have broken previous default patterns of behaviour, and as such their third album heralds a new day dawning. Gregorian chants, jackboot glam beats, string flourishes, sophisticated and lush cocktail exotica, electro funk and the twin spirits of Alan Vega and Afrika Bambaataa punctuate the record at various junctures, while the dramatic production of Feet is as immaculately-rendered as ‘Hounds of Love’-era Kate Bush. The dirt is still there of course, but scrape it away and you’ll find a purring engine, gleaming chrome. Echoing within the arrangements throughout are traces of blissed-out 60s Tropicalia, Velvets/Bowie sleaze-making and star-gazing, 80s digital dancehall, David Axelrod-style easy listening, joyous Pet Shop Boys synth crescendos, acid house, post-PIL dub, metropolitan murder ballads, doom-disco and mouth-gurning, slow-mo psychedelia so by the time it comes to a close only a fool would deny that Serfs Up! is something very special. No longer is unadulterated music malevolence Fat White Family’s stock in trade; this is cultivated music for the head, the heart. For tomorrow’s unborn children. Where once they soundtracked a grubby Britain of vape shops, Fray Bentos dinners and blackened tin-foil, a crepuscular comedown realm stalked by Shipman, Goebbels and Mark E. Smith, Fat White Family now inhabit another cosmos entirely. Serfs Up! is the product of a band of outlaws reborn. Few but themselves could have forecast it: Fat White Family survived. Fat White Family got wise. Fat White Family got sophisticated. FORMAT: Indies exclusive gold vinyl (12” heavyweight coloured vinyl WIGLP401X).